Heat oven to 400°F. In 15x10x1-inch baking pan, toss carrots with 2 tablespoons of the olive oil. Roast carrots 15 to 20 minutes, turning carefully with pancake turner every 5 minutes, until light golden brown and beginning to caramelize. Meanwhile, in 5-quart Dutch oven, heat remaining 1 tablespoon olive oil over medium-high heat. Add onion; cook 3 to 4 minutes, stirring occasionally, until translucent. Stir in garlic; cook 30 seconds to 1 minute. Stir in gingerroot and 2 teaspoons thyme. Remove from heat. Stir carrots into onion-garlic mixture. Add broth; heat to boiling. Reduce heat to medium; simmer 15 minutes or until carrots are tender. Cool 15 minutes. Meanwhile, in small bowl, mix sour cream and whipping cream; set aside. In blender, carefully blend half of cooled soup about 1 minute or until smooth. Repeat with remaining soup. Return soup to Dutch oven; heat over medium heat until hot. Stir in pepper; add salt to taste. Top individual servings of soup with a dollop of cream mixture. Garnish with 1 teaspoon thyme. You can add extra chicken broth until you get the desired consistency. Serve with slices of French bread or bolillos. 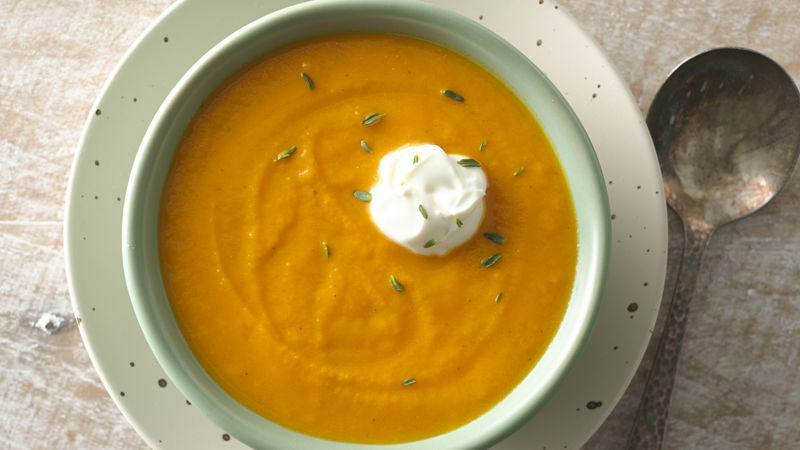 Carrots, thyme and gingerroot give flavor to a delicious sophisticated soup.